I hope you enjoy this flight of imagination today as I "interview" the Bible character Naomi. 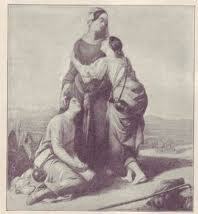 For her real story, check out the book of Ruth in the Old Testament and my book, Postcards from the Widows' Path. Ferree: Hi Naomi, Thank you for visiting WCP today, we're so glad you could join us! Naomi: I'm happy to be here. I feel like I know each one reading this. I can relate very well to just about any loss on the planet! Ferree: Oh, I know, but I'm not sure many people realize all the losses you experienced. If you don't mind, please briefly explain where you're coming from? Naomi: My dear, I'm coming to you from the essence of peace and love---a glowing, exciting place where there are no more holes in my soul, no bitterness or decay. A place where God knows me through and through. He rejoices in me! I'm finally the complete and unique person He intended me to be all along--I'm the 'real' me and I'm perfectly loved and accepted! Plus, I'm always making new discoveries and learning so much about God and His never-ending creation! Not to mention the presence of God which is entirely undescribable glory and awe . . .
Ferree: Naomi, you're talking about Heaven! You're making me want to be there! But what I meant was this--- please tell us about your life here on earth and how you were widowed and all the other losses you experienced. Naomi: Oh, yes, yes, my darling. Ahh, life on earth. It's been about 3000 years now, and since I was here less than 100 years, it seems like a vapor, just a dream. But at the time it was very real, very painful. I remember it all perfectly . . . Let's see, where to start . . . the losses I experienced . . . hmm . . . Of course they all seem like gain, now, as dear Apostle Paul said and still talks about every day (my, can that man talk!). But back to your question. I think I'll just give you a list. Ferree: Well, OK, a list would be good. We can then read more in the book of Ruth. Naomi: Ruth is such a dear! But here's my list, now that I've gathered my thoughts. And it really is a solemn and sobering thing to think about--all that I lost--even though I don't look at it that way now. I remember how awful I thought my life was at the time. (1) First, there was a famine. We had very little food and money. We were about to lose our business and our home--you call it bankruptcy now. (2) Then, we moved to Moab--and what a shock that was! I'd never been away from home before, so I was terribly homesick! I missed all my friends and family, my sweet little house and neighborhood, our Sabbath, all the sweet familiarity of Bethlehem . . . That was really hard! I tried to be enthusiastic for Eli and the boys. Really, we thought it was for the best! We could sell Eli's pottery and my fine linen along a trade route in Moab called "The Kings Highway." We could wait out the famine, make a nice bundle of money, and be pretty well set when we went back to Bethlehem. That was the plan. Ferree: So you're saying is that the move to Moab was pretty traumatic! You went bankrupt. You moved to Moab where you didn't have any friends or relatives. Plus, you couldn't pick up a phone and call anyone! You couldn't message on Facebook or Twitter, email or send a letter! Naomi: That's right! And then (3) Eli died. In a snap!--he was gone! (4) My sons, Mahlon and Kilion married foreign women, an awful sin in my eyes because I knew God told us Israelites not to marry idolators. I was so upset, but I grew to love Ruth and Orpah as if they were my own. (5) And then... Mahlon and Kilion died. I was decimated. I felt cursed and hopeless! It was very stressful! Plus, there was no government, no police protection, no military--it was "the days when the judges ruled"--if there was a judge. Everyone did what was right in their own eyes. That's why Eli and I moved to Moab--it seemed right in our eyes. It was a mistake, but God allowed it and worked it for an ultimate good. Ferree: Naomi, you say that with such a good attitude. But you had at least 5 losses. Were you always as upbeat and honest as you sound today? Naomi: I think just about the whole world knows my most embarrassing moment: my meltdown when I arrived back in Bethlehem. I thought I'd explode from the exhaustion and stress of those ten years in Moab--and I did! Right there on the street in Bethlehem, surrounded by a crowd of welcoming friends I freaked out and started screaming. "Don't call me Naomi! Call me Bitterness!" Then I ranted and raved that God afflicted me! I kept repeating that, louder and louder each time! "The Lord did this! The Lord did this! The Lord did this!" So to answer your question---No--- I was far from upbeat and positive that day. I was honest, though. I was beaten down, bitter, and full of despair. Ferree: So you've been there. Sorrow. Loneliness. Feeling abandoned. You know what its like . . . What would you tell widows today? Any advice? Naomi: Well, this might not seem like much because folks today want life laid out in three easy steps. Easy steps are seldom realistic. Instead, I'd gather all widows close to me and hug them in a way that would absorb all their pain. Mind you, this hug that might take days, or weeks, or months . . . . After that, I'd dab away the tears, and then I would simply say, "Read my story." Widows don't ultimately need any "how to's" or three-step plans. They're on a journey, so God gave them my story--the journey of a woman who'd lost everything--money, job, home, friends, husband, sons . . . My story has all the direction they'll need. That's was widows need--- my story. And I mean all of it. It doesn't drop off at the end of Ruth, you know? My story streams to the book of The Revelation, bobbing up in the very last verses of Scripture where Jesus Himself says "I am the Root and Offspring of David." You know that David is my great-great-grandson, right? See? In spite of everything I went through . . . my hurt, confusion, anger, bitterness . . . the Root of David was with me. I didn't realize it at the time, but God was setting the stage for eternity --for my offspring and my Savior-- and my part in it. He's doing the same for widows today. No eye has seen, no ear has heard, no mind has conceived what God has prepared for those who love him. God has a plan for each widow that affects her children by blood, her children by Spirit (like Ruth was to me), her friends, her world of influence and . . . Eternity! That's why they're still alive. They'll get through the pain and when they do, an amazing harvest will bloom. Yes. That's what I'd say to widows today. Read my story. It contains the hope they need. It's part of Christ's story. Ferree: Thank you Naomi. Would you pass me that Kleenex? The first thing I was able to read after the death of my husband was the book of Ruth. I knew that she and Naomi understood. Thanks for the interview. Love it!!! Wow..this is just wonderful! I love how you have done this! Giving her perspective of her losses (gains) from Heaven and her time on Earth. I love her honesty and thank you for bringing that out like you did. I love this part "the losses I experienced . . . hmm . . . Of course they all seem like gain, now"
Now..if you could pass me a Kleenex..wait..maybe you should just pass me the box. Thanks, Ferree! That was great!